Wheels: 18 x 7 2-Tone Aluminum Alloy, Trip Computer, Transmission: CVT, Transmission w/Oil Cooler, Tires: P225/55R18 All Season, Tailgate/Rear Door Lock Included w/Power Door Locks, Strut Front Suspension w/Coil Springs, Steel Spare Wheel, Speed Sensitive Variable Intermittent Wipers, Single Stainless Steel Exhaust w/Chrome Tailpipe Finisher. This Mitsubishi Outlander has a powerful Regular Unleaded I-4 2.4 L/144 engine powering this Variable transmission. *These Packages Will Make Your Mitsubishi Outlander ES The Envy of Your Friends *Side Impact Beams, Seats w/Cloth Back Material, Rocker Panel Extensions and Black Wheel Well Trim, Remote Releases -Inc: Mechanical Fuel, Remote Keyless Entry w/Illuminated Entry, Illuminated Ignition Switch and Panic Button, Rear Cupholder, Rear Child Safety Locks, Radio: AM/FM Stereo -inc: 7.0 touch panel display audio, 6 speakers, Digital HD radio, Bluetooth wireless technology, steering wheel audio controls and USB port, Radio w/Seek-Scan, Clock, Speed Compensated Volume Control, Voice Activation and Radio Data System, Power Rear Windows and Fixed 3rd Row Windows, Power Door Locks, Power 1st Row Windows w/Driver 1-Touch Up/Down, Perimeter Alarm, Passenger Seat -inc: Fold Flat, Outside Temp Gauge, Outboard Front Lap And Shoulder Safety Belts -inc: Rear Center 3 Point, Height Adjusters and Pretensioners, Multi-Link Rear Suspension w/Coil Springs, Manual Tilt/Telescoping Steering Column, Manual Adjustable Front Head Restraints and Fixed Rear Head Restraints, Low Tire Pressure Warning. 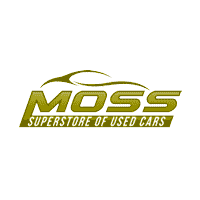 * Visit Us Today *Live a little- stop by Moss Used Super Store located at 1545 SE Evangeline Thruway, Lafayette, LA 70508 to make this car yours today!